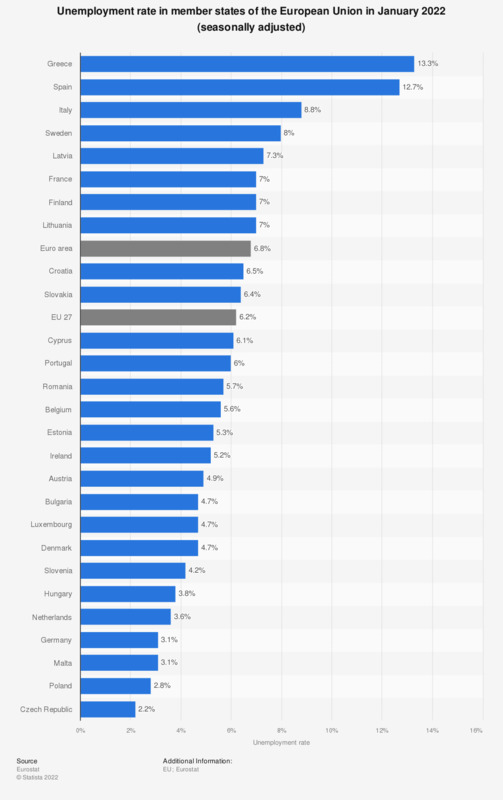 The statistic reflects the seasonally adjusted unemployment rate in member states of the European Union in January 2019. The seasonally adjusted unemployment rate in Spain in January 2019 was 14.1 percent. The unemployment rate represents the share of the unemployed in all potential employees available to the job market. The unemployment rate is an important measure of a country or region’s economic health, and despite unemployment levels in the European Union falling slightly from a peak in early 2013 , they remain high, especially in comparison to what the rates were before the worldwide recession started in 2008. This confirms the continuing stagnation in European markets, which hits young job seekers particularly hard as they struggle to compete against older, more experienced workers for a job, suffering under jobless rates twice as high as general unemployment. Some companies, such as Microsoft and Fujitsu, have created thousands of jobs in some of the countries which have particularly dire unemployment rates, creating a beacon of hope. However, some industries such as information technology, face the conundrum of a deficit of qualified workers in the local unemployed work force, and have to hire workers from abroad instead of helping decrease the local unemployment rates. This skills mismatch has no quick solution, as workers require time for retraining to fill the openings in the growing science-, technology-, or engineering-based jobs, and too few students choose degrees that would help them obtain these positions. Worldwide unemployment also remains high, with the rates being worst in the Middle East and North Africa. Estimates by the International Labour Organization predict that the problem will stabilize in coming years, but not improve until at least 2017. * as of December 2018 ** as of November 2018 For Germany, the Netherlands, Austria, Finland and Iceland the trend component is used instead of the more volatile seasonally adjusted data. Would you like the European Union to intervene more or less than at present in the fight against unemployment?